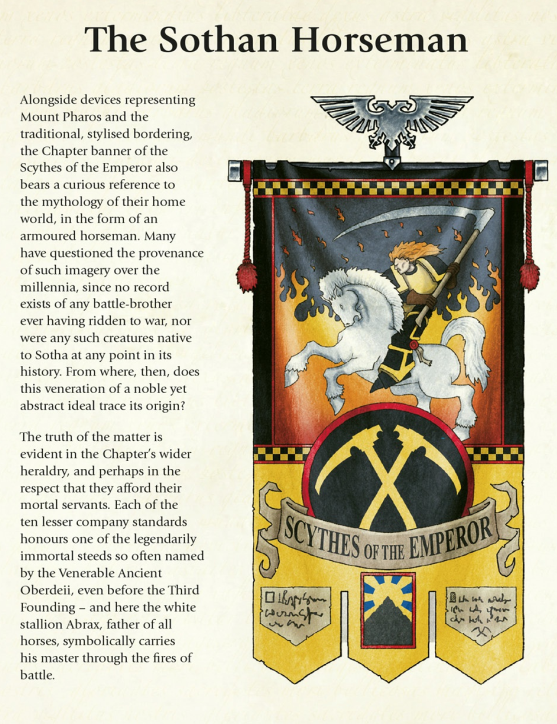 The Scythes of the Emperor have just had an interesting tid bit about the Chapter, put forward by Black Library’s L.J Goulding; The horse motif is known as Conabos. In addition, the regular use of power falx throughout the combat. Though I suspect the artist of the book cover read that as power Scythes. Quite a different weapon to a falx sword. 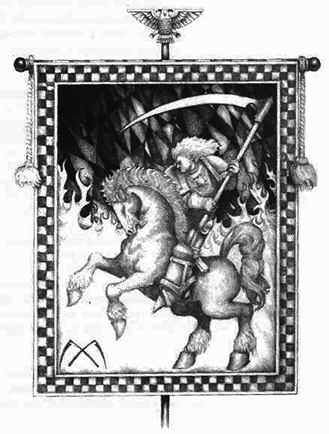 In the Black Library Short Ficiton, Heloth, the Scythes Second Co. use the horse Conabos (Of Greek Myth, Ares Chariot fame) is this possibly an indication of GW using Ares’ horses as Company motifs? Perhaps, the fourth – Phobos (“Terror”) is for the 1st Company? Speculation from scraps to be sure, for what little is left of Sotha and the Scythes? However it is an interesting indication of not only background themes, but a closer tie to Greek Mythology for Sothan collectors to exploit. Edit.2016 Nov. – There is potential that a fuller explanation of the Banners will be found in the Scythes of the Emperor novel and omnibus coming in January 2017 from Black Library.